If there is something that passionate gamers truly covet, it is a gaming computer that understands them. The latest Alienware M17 AWm17-7105SLV-PUS gaming laptop—also the thinnest 17-inch Alienware yet, with a profile of 0.9”—comes staggeringly close to fulfilling that lofty aspiration. Powering this mighty machine is an Intel Core i7 processor and the newly launched NVIDIA GeForce RTX 2070 graphics. It boasts of not only the strength to run your favorite AAA games but also be sustainable and super stylish while at it. This gamer, priced at $2,199.00, doesn’t come cheap; however, it seems to be a worthy price to pay for the 17-inch form factor, the thin build, and the power within. In this review, we inspect the various features of Dell’s most recent gaming laptop and assess its fitment as a companion for the most ardent of gamers. The Intel Core i7-8750H processor (eighth-generation) driving this laptop proves to be highly competent, speedy and efficient, even when you play games with CPU-intensive paraphernalia. It is a six-core processor that can be overclocked up to 4.1GHz with Turbo Boost. Supporting the CPU is 16GB RAM (DDR4), with a 512GB SSD and a Windows 10 Home operating system. The SSD helps reduce the load times of your games and also maintains considerable silence even when things are intensely heated up on the battlefield. Let us review the heat dissipation mechanism—a critical aspect of any gaming machine worth its salt. 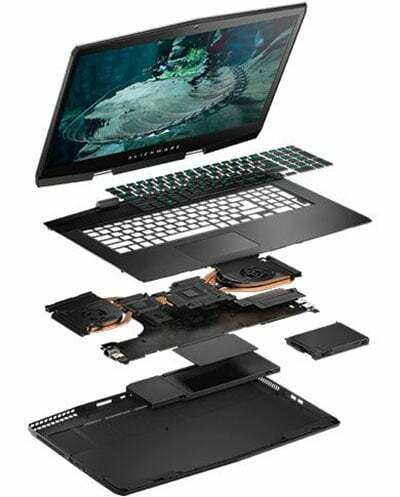 This Alienware uses the Cryo-Tech V2.0 cooling mechanism that employs a “dual-intake, dual-exhaust” design. The liquid-crystal polymer fans are built to enhance air circulation with larger blades, while copper heat pipes effectively keep both the CPU and the GPU running smoothly. Suffice it to say that the laptop is efficient enough to guarantee sustainability alongside optimum performance for games that demand it. In that latter pursuit of optimizing gameplay, this laptop also benefits from the handy Alienware Command Center. It lets you fine-tune the hardware and software depending on what you are currently playing. 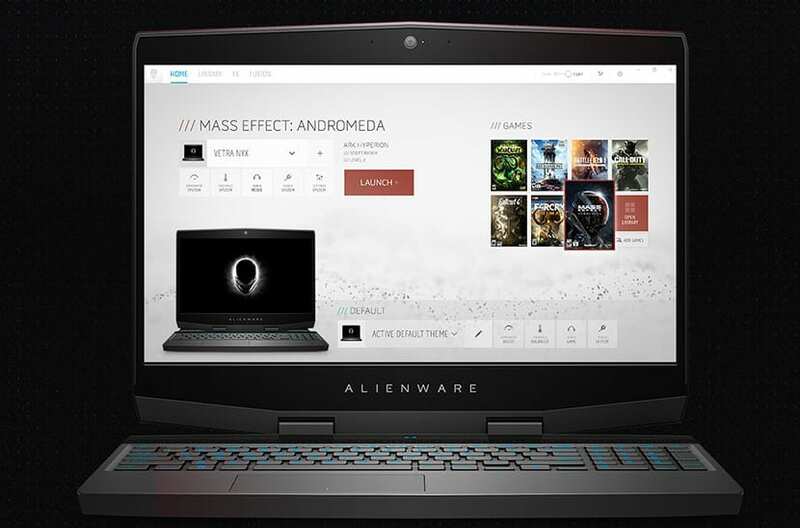 In conjunction with Ace Library Science—the Alienware interface for linking system settings with your gaming library—you manage to have excellent control over everything with super-customized gaming profiles. Since this is a 17.3” machine, you get plenty of screen space to immerse yourself in the proceedings. The FHD screen offers a resolution of 1920 x 1080 which is ample for most modern titles. The monitor also has an IPS panel (In-Plane Switching) to allow comfortable viewing across positions. This is particularly useful during unending gaming sessions when your sitting position could change dramatically from the armchair to the couch! Here is the best bit about the display: you can enjoy graphics support for NVIDIA GeForce RTX 2070 (with Max-Q Design and 8GB of dedicated memory). This new-age graphics coprocessor announced by NVIDIA early in 2019 is infused with the power of real-time ray tracing and images enhanced by artificial intelligence. The difference that its Turing architecture makes can be phenomenal; you can experience it in the way special effects and shadows get rendered on the screen. Plus, with many game-makers announcing RTX-special upgrades, you stand to gain from the future-compatibility. On the flip-side, the refresh rate of the screen is less than optimal: 60Hz. This will still be adequate for many games—especially those that do not involve too many changing movements (read strategy games). But you might find yourself wishing for a 144Hz-screen when you play shooter games. 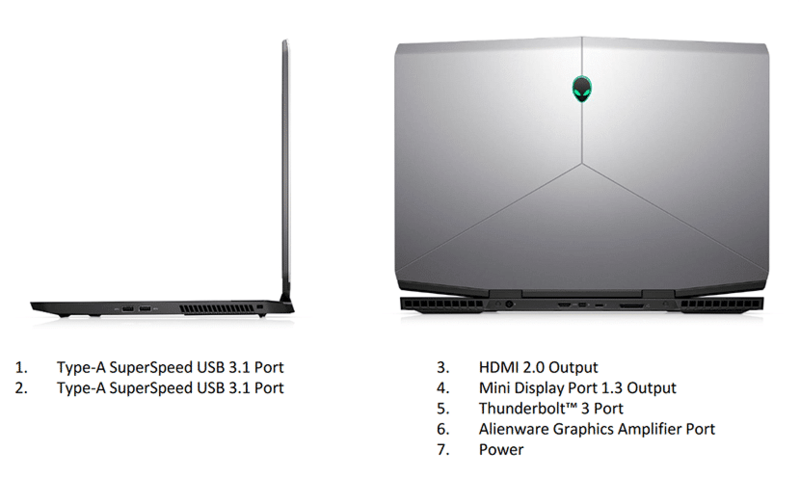 A highlight of the new Alienware (silver) is definitely its slim build. Even though this is a full-purpose, 17-inch gaming laptop, its profile is astonishingly thin at only 0.9”. 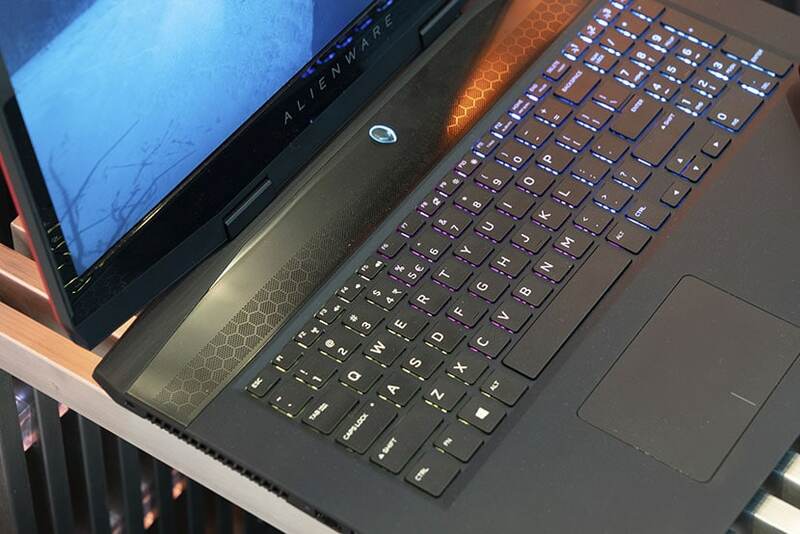 Not only is this the thinnest Alienware yet, but also one of the leanest in its league. 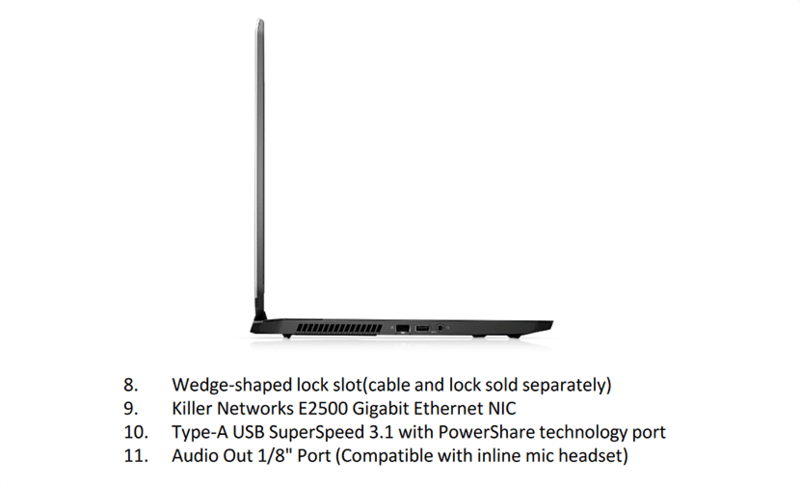 The slim profile lends a certain degree of portability to the laptop along with a distinct style quotient. Note that the weight is anything but low at 11.68lbs—a fairly standard metric for other gaming devices in this space. It is worth mentioning how Dell has carefully ensured that all the construction material used for this laptop adheres to strict build tolerances. The choice of premium-grade material such as magnesium alloy—one of the lightest structural metals—ensures that the computer lives a good, long life and doesn’t wear out under the stress of all that gameplay. 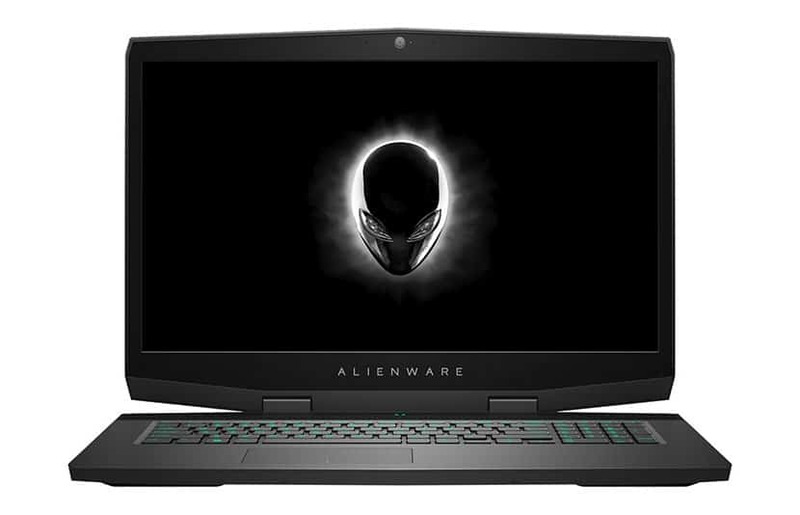 To its merit, the Alienware M17 also brings to the table additional pro-gaming features that are certain to find favor with the target population. Killer E2500 (a Gigabit Ethernet Controller) is one of these and works hard to expand throughput while reducing latency as you game on. The result is a smooth playing experience with minimal jitters. Plus, you have the option to upgrade to Killer Wireless-AC 1550 (up to 1.73Gbps) and Killer DoubleShot Pro to prioritize the network bandwidth for your game. Another winsome feature of this computer is its gaming-special keyboard with FX Lighting. Customizable backlighting adds a whole new dimension to gameplay, and here you can choose from a multitude of colors for different system zones. It is genuinely liberating and highly personal. Can you connect to peripherals such as mice and controllers? Certainly. There are three USB 3.0 ports to let you plug into any devices that you need and expand your gaming horizons. Besides the USB support, this computer also sports a built-in front-facing FHD camera and dual-array microphones. Special bonus: speech support from Windows Cortana. It can be quite convenient to issue voice commands and see things get done magically, without the need to type in stuff. 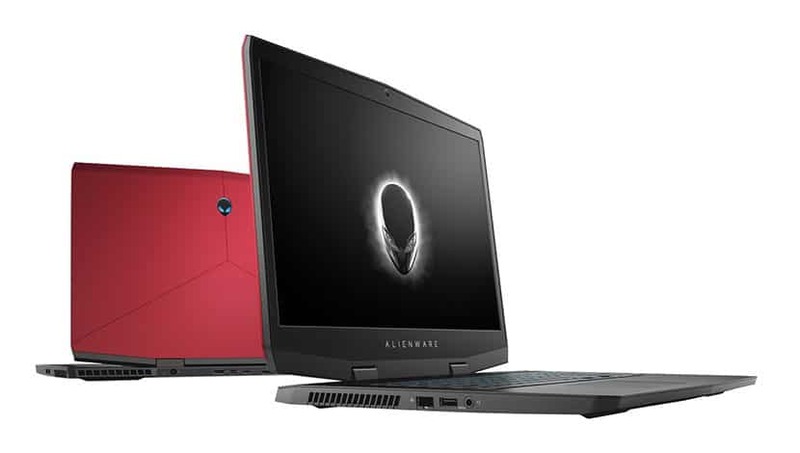 The Alienware line-up by Dell has established for itself a prominent space in the gaming laptop market, thanks to speedy performance, high-end graphics, and reliability you can fall back on. The new Alienware M17 AWm17-7105SLV-PUS expands this legacy, by also adding a stylish build to the mix and a thin profile that elevates the overall appeal (and flexibility) of this machine. Thumbs-up!